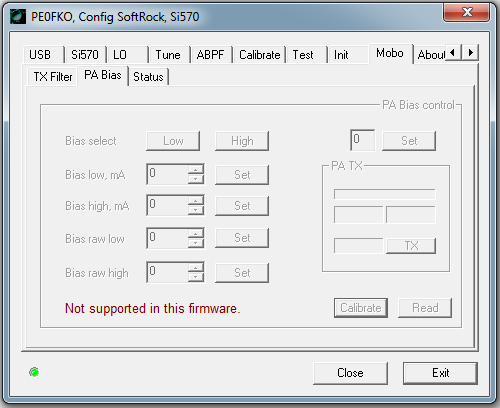 The ConFiG SoftRock tool (CFGSR.exe) can be used to configure the SoftRock USB Si570 firmware. 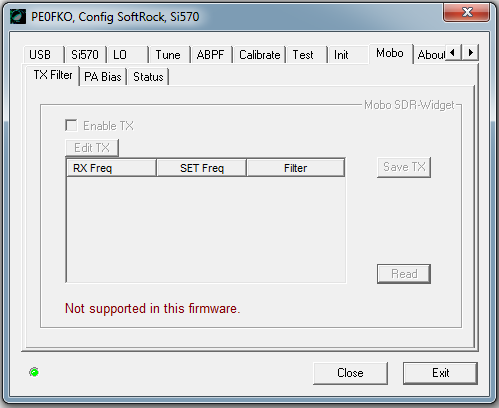 This firmware is the official supplied firmware in the SoftRock SDR kits of Tony Parks that are using a Si570 chip from Silicon Laboratories (SiLabs). SiLabs did create a new version of the Si570 chip that can be ordered with a 7ppm temperature stability. The only disadvantage of the new chip version is the change of internal registers, the firmware need to know if it is a old or new chip version, my firmware (V15.15) will do a auto-detect to check the chip version. Beside this CFGSR program there is also a ExtIO_Si570.dll file to be used with Winrad and clones like the HDSDR or others. The CFGSR and ExtIO_Si570 are now based on the same source files and will function (almost) the same. With the installation of this package you will also get the ExtIO on your system, you must copy the file to the Winrad executable directory. The installation can be done by running the Microsoft Installer setup file that will download the correct msi file. That will create a directory /CFGSR/ in the Program files directory, and add a menu entry in start programs. The programs are signed with a certificate of the Amateur Radio Certificate Authority. The general screen shows the version number of the connected firmware also the USB manufacture / product and version number read from the firmware is shown. The USB screen will show in the listbox the libUSB-win32 devices that are connected to the PC. (If the filter driver is installed all the USB devices will be seen). By clicking on a device the information is copied to the fields above that are used for selecting the device that will be connected. A empty field will match any value. The "Auto connect" switch can be used to connect to every device that confirm the credentials. It will connect at program startup and on inserting the device in the USB port. i2c Addr: Pressing the save button the I2C address is saved in the firmware and used to communicate between the AVR chip and the Si570 chip. The I2C address will be used in some call's to the old firmware (V1.4). Startup: The startup frequency is the first frequency the firmware will use after a startup. It will stay on that frequency until it receives a other frequency command. The VFO frequency is also displayed for the startup frequency. Smooth: The firmware support the smooth-tune option, the range of it in ppm (parts per million) can be specified. The datasheet default is 3500ppm. Si570 Grade: The grade of the used Si570 chip, grade can be A, B or C. The firmware (V15.14) will correctly exclude the not available dividers. DCO min: The minimal DCO value can be extended. Read the datasheet of the Si570 for the DCO usage. DCO max: The maximal DCO value can be extended. Read the datasheet of the Si570 for the DCO usage. Index: The Si570 internal RFREQ registers index. The value is normal 7, the new Si570 type 7ppm is using 13. The firmware can do a auto-detect (auto-detect is the default value). 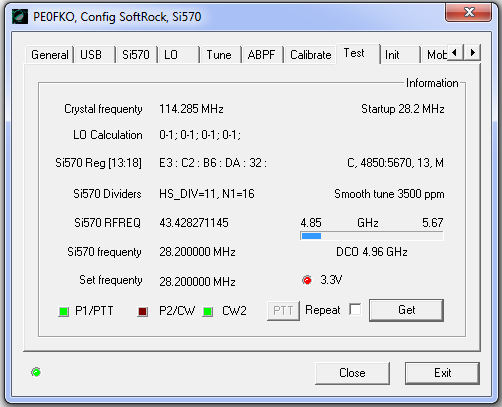 Freezes M: The new Si570 can lock the frequency when updating the RFREQ register. When using this on a old chip it will not change anything, but the set frequency will take some more time. Button Reboot: This will reboot the firmware. A USB disconnect will happen and, with auto connect, it will connect again. Button Reset Si570: This will reset the Si570 chip to it's factory default frequency. That is something else as the "Startup frequency"! Every Si570 chip will have a tuned factory default frequency from Silicon Laboratories (SiLabs). After pressing this button it will output that frequency, it can be used in the calibrate process. Button Factory default: This will reboot the firmware and put it back to the factory default settings in the AVR chip. A USB disconnect will happen, and with auto connect, it will connect again. The LO screen will be used for the calculation of VFO frequency. Specifying a frequency in the SDR software aplications need to be recalculated to a specific Si570 frequency. It all depents on the hardware configuration of the receiver and maybe the used converters. Bob G8VOI did write some interesting documents about that. In all cases the frequency calculation can be done with a (real number) multiply and offset value. The box "LO: Total" is used to specify with offset and multiply factor is needed. The "LO: DLL" specified the part of the calculation done in the SDR application software and the "LO: Firmware" specified the part that is done in the firmware. The button "Read" and "Write" can be used to read the firmware offset and multiply value's or to write the changed value's to the firmware. It will also display the "Set frequency", Freq from the PC to the firmware over the USB. Also the "Si570 output frequency", real Si570 frequency with possible calculations done. Also the selected filter from the ABPF will be displayed (if ABPF is enabled). If the firmware support the "automatic band pass filter" function (ABPF), this screen can be used to change the filter cross over points. It is only useful when the "Electronically Switched BPF Kit" of Tony is ued. The function can be switched on / off with the enable button (default ON). The Si570 chip is calibrated at the factory within 1.5ppm of it factory startup frequency. So entering the "Factory startup frequency" can be used to calibrate the internal crystal value. 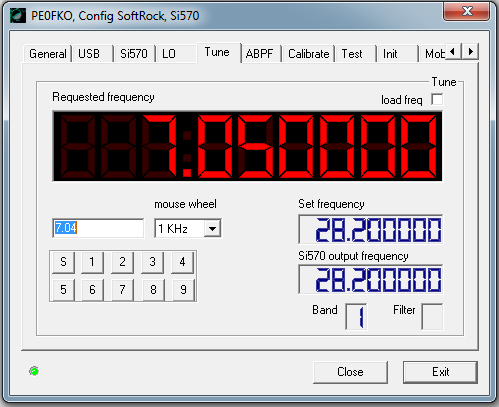 For the most Softrock V9.0 the Si570 used 56.32MHz as the startup frequency. Calibrating the chip this way will set it at +/- 85Hz. If you want to calibrate with a frequency counter follow the next steps. First Reset the Si570 to "Factory default" frequency (TabBlad "Si570", button "Reset Si570") so that the output is the factory default startup frequency of the Si570 chip. Then measure the Si570 output frequency and use that value (MHz) in the "Calibrate A" procedure. To reset the internal crystal value to 114.285MHz press "Reset". And to copy the crystal value in Hz press "Ctrl-C" button. Overview of most of settings in te firmware and Si570. Crystal frequency: The used Si570 internal x-tal frequency. The default of 114.285Mhz must be calibrated to be Hz exact. Startup: Default startup frequency is used to set the Si570 after the boot of the firmware. Only for the new Mobo kit users. V1.0 at 04/09/2009: First release. V1.1 at 16/09/2009: Microsoft MFC library static linked. V1.2 at 17/09/2009: Bug fix for old firmwre V1.4 (CFGSR + SRDLL). V1.3 at 20/10/2009: Bug fix for ABPF Enable. V2.3 at 14/02/2011: Many changes and for lates firmware versions. V2.4 at 11/12/2011: Update for the firmware V15.15, new Si570 chip. V2.5 at 08/04/2012: Simple TX functionality for HDSDR. 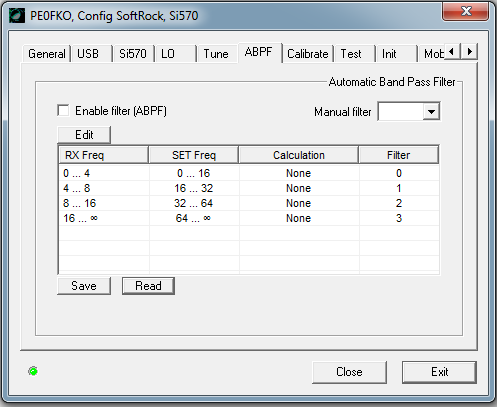 V2.6 at 09/05/2012: Small bug-fix Initialize SoftRock bandfilter setting. 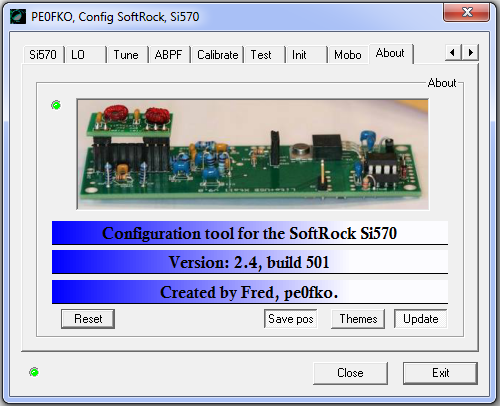 Only for software developers: SoftRock DLL. 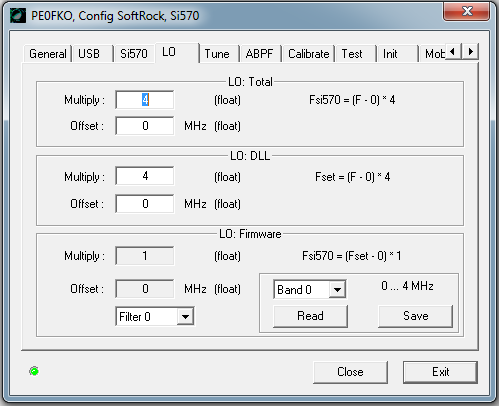 The SoftRock Config tool is using a SoftRock DLL (SRDLL.dll) to handle the protocol and the USB interface. 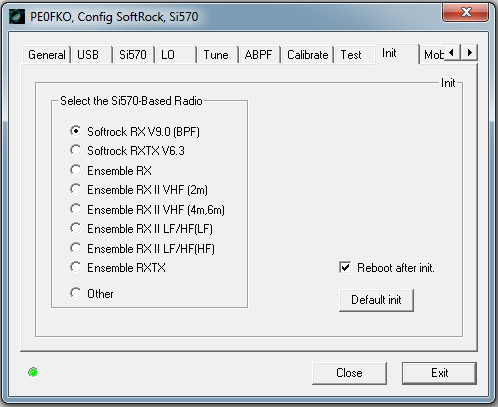 All the firmware commands are available in the SRDLL and the interface to the SoftRock is back to only a srOpen(...) and srClose() call and for example a srSetFreq(7.040) command. 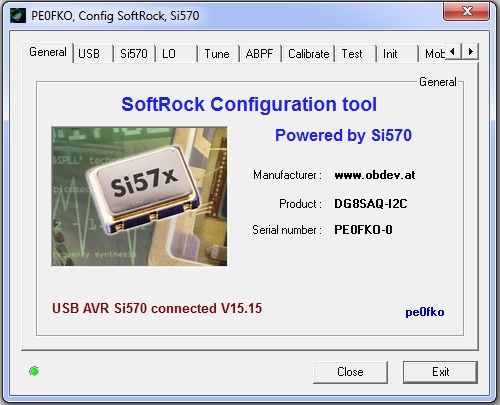 I expect that if you like to control the SoftRock V9.0 from your application software and don't want to handle all the USB and interface data formats the dll can be very handy. 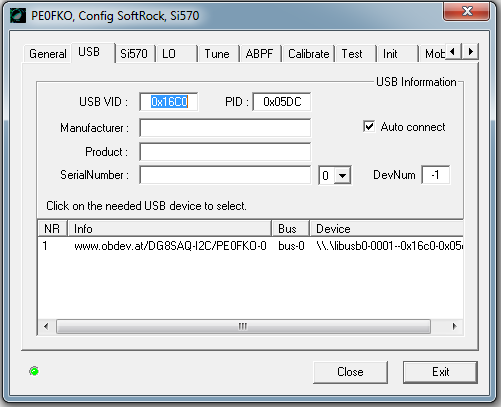 The SoftRock Config tool is using this dll for all the communication with the firmware, only the special list control in the USB tab-blad is using direct USB call's. I did add a command line example program CMDSR.exe to the distribution so that the usage can easely been seen. The SRDLL source can also be direct included in your program, like it is done with CFGSR and ExtIO, no extra DLL need to be handled then. V1.1 at 17/09/2009: Bug fix for old firmwre V1.4.